What Do You Do If Your Car is Sliding on Ice? When your car impacts ice and begins to slide, do you know what to do? Do you apply the brakes? Turn into the slide? Turn away from the slide? Do nothing? 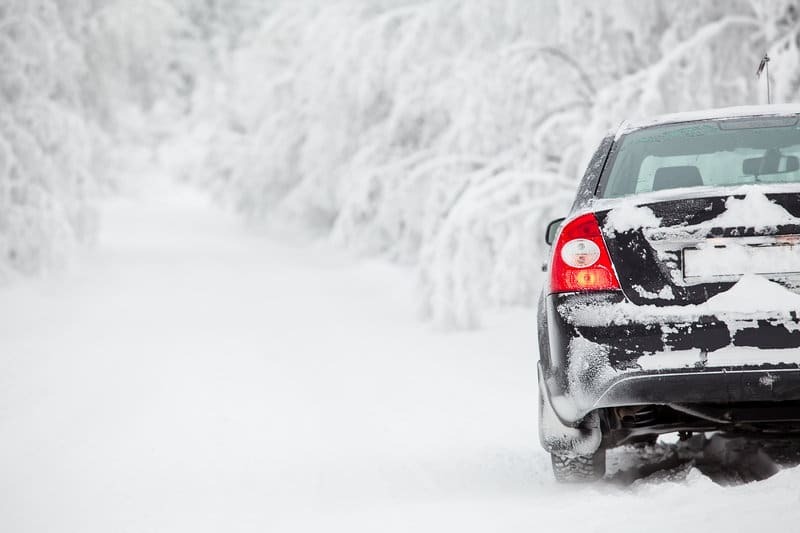 Read on to learn some important tips on how to drive safely this winter. Winter snow can be magical one moment and deadly another. When your vehicle is sliding out of control, knowing what to do in those brief seconds and moments can make all the difference. Here are five things to do when you find your car sliding on ice. Your first impulse when you feel yourself slipping out of control–literally–is to apply your brakes and stop the vehicle. But, on ice, you follow a different protocol. Applying your brakes is going to make your slide worse. To correct a slide, your wheels need to be moving freely. This goes against your instincts, but to help when you are sliding, you actually want to turn in the direction of the slide. What does this mean? When the rear of the car is drifting to the right and the nose of the car is pointing to the left, you would turn right to straighten out the car. This is called “turning into the slide.” As your car begins to straighten, you can also straighten your wheel. The amount of steering needed to straighten the car depends on how severe your slide angle is. Try and use proportionate steering to how severe your slide is. Gently maneuver the wheel. Correcting your slide in one direction, will result in the car returning back in the opposite direction before it, ultimately, stabilizes. Expect this rocking back and forth motion and respond with care. If you oversteer, you can put the car in a full spin. Oversteering results from a sharp, hard wheel reaction to a spin. Oversteer occurs when the rear wheels start skidding before the front wheels causing the back of the car to swing out towards the outside of the curve. One of the best ways you can stay calm when your car is sliding on ice is what you are doing right now–get educated! Knowing what to do BEFORE you are in a scary situation can save lives. Learn what is meant by “turning into the slide.” If you live in an area with frequent snow storms or ice, take your car to a large parking lot and practice what to do when the car slides. Again, staying calm is key. Panic will cause you to oversteer and can result in a more serious slide, spin or accident. Want to prevent a serious sliding issue? Reduce your speed! If the roads are icy, or covered in snow, it is important to slow your vehicle. The Federal Motor Carrier Safety Administration advises that you reduce your speed by by 1/3 on wet roads and by 1/2 (or more) on snow packed roads. To break this down a bit more, if traveling at a speed of 60 mph on dry pavement, then on a wet road you should reduce your speed to 40 mph, and on a snow-packed road you should reduce your speed to 30 mph. Slick, icy roads require even slower speeds and even pulling off if you can’t drive safely. Another way to stay safe during inclement weather conditions is to ensure that your car is prepared for the weather. Get your tires checked to make sure they have enough tread to support driving. Get your brakes checked to make sure they are prepared to respond to you when you need them to! Contact Scott’s Fort Collins Auto today to be prepared for winter road conditions. You can schedule an appointment online or call (970) 682-4202 to arrange your next visit.